A family of vegetables consisting of five varieties classified according to shape and growth. Vitamin A and potassium are the most notable nutrients in lettuce. The darkest green varieties provide the highest levels of Vitamin A. The five varieties are butterhead, crisphead, leaf, cos or romaine, and celtuce. 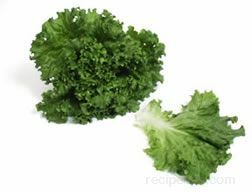 The leafy green vegetable is used in salads, cooked vegetable dishes, and is commonly used on sandwiches. When purchasing lettuce, look for freshness, selecting lettuce that does not have wilted and discolored leaves. 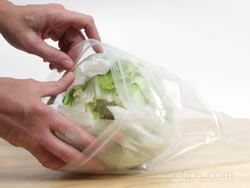 To store lettuce, wash the lettuce and dry the leaves with paper towels, seal or wrap it securely in plastic and place it in the coolest part of the refrigerator, which is generally located in the rear and lowest shelf section of the refrigerator. Along with crisphead lettuce, butterhead is one of the two main types of head lettuce. This vegetable is a small head lettuce with leaves that grow close to and surrounding the head of the vegetable. The leaves may be light green to dark green or a reddish purple color. 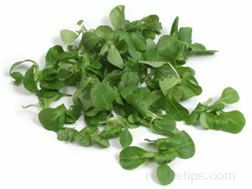 Small loose-headed greens with tender soft leaves provide a sweet flavor for salads and sandwiches. It is also known as bibb, Boston or limestone lettuce. Iceberg Lettuce Along with butterhead lettuce, Crisphead is one of the two main types of head lettuce. Crisphead lettuce varieties feature tightly packed pale green leaves that grow in large, round heads that provide crisp and sweet salad greens. 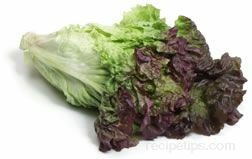 Often mistakenly referred to only as iceberg lettuce, crisphead lettuce actually has several other varieties, such as imperial, Great Lakes, vanguard and western. The most popular of the garden lettuce, this vegetable is a loose-leaf variety of lettuce that can be grown as a flat, smooth, rough, round, frilly or oak shaped leaf. The colors commonly grown can range from bright green to a red-bronze color. A lettuce that originated on the Aegean island of Cos. 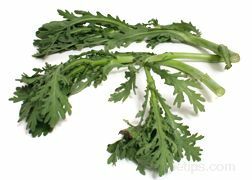 It grows in a head of long narrow leaves that have a crunchy rib down the center and a mild tangy flavor. 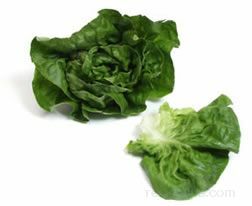 It is an excellent lettuce for salads and sandwiches and is the lettuce most commonly used in Caesar salad. 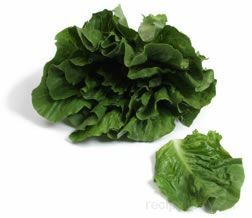 Cos lettuce is available throughout the United States and should be refrigerated at very cold temperatures to keep its leaves crunchy. 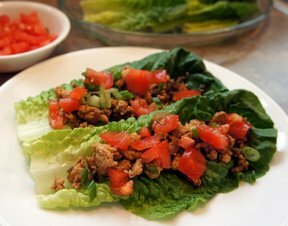 Cos Lettuce is also known as romaine lettuce. A kitchen device used to remove excess moisture from freshly washed lettuce, greens, herbs, fruits, and other similar leafy or hard to dry items. The washed product is placed in a perforated basket that fits into an outer container. The outer container has a fitted lid that has a pull cord, a hand crank, or hand pump handle, which is activated to spin the inner basket, forcing excess moisture off the food and out the perforations in the basket. The moisture is collected in the outer container and discarded after the inner basket is removed. After spinning the greens, they may remain slightly moist and require blotting with a paper towel. This step may be combined with the spinning process by adding a couple of paper towels to be spun along with the greens. The paper towels will help soak up the excess moisture during the spinning process. If delicate items such as raspberries are to be dried, line the spin basket with several layers of paper towels to absorb not only the moisture but also the impact. This will assist to keep the berries from becoming bruised and mashed. Some types of lettuce require different preparation than others. Basic preparation consists of cleaning and drying. Some need to be cut or broken into smaller pieces before serving. Loose greens should have the damaged, wilted or yellowed leaves removed and the remaining greens should be soaked in cold water and drained. This process should be repeated until there is no longer any sediments at the bottom of the bowl. They can then be placed in a lettuce spinner to dry. 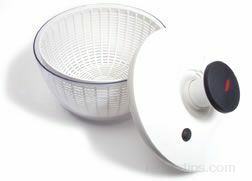 If you do not have a spinner, they can be drained in a colander and then placed in a bag with a couple of paper towels and gently shaken. The paper towels will collect most of the excess moisture. Preparation for head lettuce is shown below. 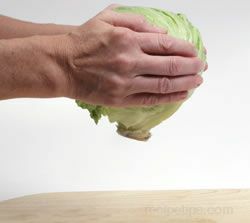 Hold the head of lettuce in both hands about 6 to 8 inches above a solid surface. Be sure the core end is down. Bring the head down, hitting the core solidly on the surface. The solid hit will separate the core from the head and it can then be easily twisted and pulled from the head. 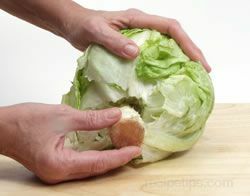 Before using, thoroughly wash the head of lettuce by running cold water over the core end once the core has been removed. Pull off any damage leaves and then allow the water to drain by placing the head in a colander, core end down, so water can drain out. To serve, tear into bite size pieces and toss with other ingredients. It is best to tear pieces off by hand, but if you want to cut it, be sure to use a knife with a stainless steel blade. Knives with other types of blades can cause the lettuce to discolor and also affect the taste. 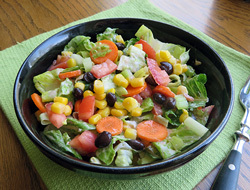 Lettuce is typically eaten raw with a favorite salad dressing & toppings or as a topping for a sandwich. Wilted and/or leftover lettuce can be added to soups/stews. Add them at the end of cooking. It is best to tear lettuce by hand rather than cutting with a knife. Lettuce tends to brown quicker if a knife is used. 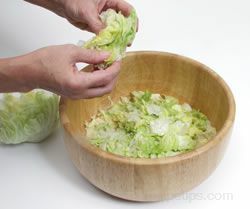 Do not add dressings to lettuce salad until just before serving, this will prevent lettuce from becoming soggy. 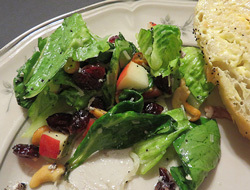 Salad dressings will spread more evenly if lettuce is dried sufficiently. In the event that your lettuce is still a bit wet after spinning, try ripping a paper towel in 4-6 pieces and tossing with your lettuce. The towel will soak up any remaining moisture.